We’ve said it before and we’ll say it again, the small positive changes that you make in your life can have the biggest effect on your health and wellness. At Parker Dentistry Facial Rejuvenation and Wellness, we are more than just a family dentist. We want to promote healthy lifestyle choices so that all of our patients can live a life that is full of good health and abundant happiness. It’s truly amazing how so many factors play into our health and wellness, including oral health and oral hygiene practices. As a family dentist that is focused on overall health, we thought in honor of National Nutrition Month, we would offer a few healthy habit tips that can change your life for the better. Drink less soda and more water. There are zero health benefits gained from drinking soda or other artificial sugary drinks. In fact, regular consumption of sugary beverages can cause weight gain, tooth decay, diabetes, and other health aliments. If water tastes boring to you, try adding fresh fruit, cucumbers, ginger, or mint for a healthy twist. Eat real food. If you can’t pronounce or don’t know what the ingredients listed on the food you are about to consume are, you shouldn’t eat it. Start taking Juice Plus+. The benefits of taking Juice Plus+ everyday are extraordinary. This whole food nutrition is an incredible addition to your everyday diet and routine. Talk to Blake or Honi if you are interested in learning more. Juice Plus+ is something the entire Parker family truly believes in and has been taking for over a decade. The proof is in the research and in the health of our family. Brush your tongue. While brushing and flossing your teeth at least twice a day is critical for keeping a healthy smile and preventing tooth decay and gum disease, brushing your tongue is another important step you need to add to your oral hygiene routine. The back of your tongue hosts a lot of bacteria that is not removed when you just brush and floss. A healthy mouth helps promote a healthy body. Wear sunscreen year around. The sun shines down harmful rays all year long. Even if you aren’t in your bathing suit at the beach, your skin can still be damaged from short bursts of time out in the sun. Look for products that contain sunscreen, such as moisturizers, foundations, powders, chap stick, lip gloss, and even just a light every day sunscreen to ward off early signs of aging and an increased risk of skin cancer. Get more sleep. Your body needs seven to eight hours of sleep every night in order to repair and perform necessary bodily functions. Treat yourself to a sufficient sleep. Take a break from screens. We spend more time looking at our computers, phones, tablets, television, and other devices than we ever have before. It is a habit that needs to be broken. Too much time staring at a screen has been linked to eye problems, sleep issues, and even mood disorders. Give your eyes a break every once in a while, and spend your leisurely time doing something better for your health and happiness. Spend more time with the people whom you love. Spending time with people who are positive, kind, loving, and supportive actually contributes to your health and wellness. Making time for the people who bring the most joy into your life is an effort you should never fail to make. Move more. The more you move the better you will feel. Engaging in as little as 30 minutes of physical activity a day can make a world of a difference in your overall health. A sedentary lifestyle is one that promotes health maladies. Get your blood flowing, your heart pumping, and your muscles moving for a healthier tomorrow! One of the simplest approaches to eating a well-balanced and healthy diet is to eat real food. As a family dentist and wellness advocate in Hollywood, Florida, we truly believe health and wellness starts in the mouth. We are very fortunate to live in Florida where an abundance of fresh produce is grown in our state and throughout the year. Eating fresh locally-sourced food not only benefits your body, but also the environment. A good rule of thumb is if you can’t pronounce the ingredients, don’t eat it. In honor of National Nutrition Month at Parker Dentistry Facial Rejuvenation and Wellness, we want to inspire you to eat more Florida fruits and vegetables! Avocados, bell peppers, blueberries, broccoli, cabbage, cantaloupe, carrots, cauliflower, celery, eggplant, grapefruit, guava, Key limes, lettuce, mangoes, mushrooms, oranges, papayas, passionfruit, potatoes, radishes, spinach, squash, strawberries, corn, tomatoes, and watermelon. The food choices that we make every day play a major role in the quality of our health. It is far easier to maintain our health than it is to recover it. Diet is one of the components of our life that we have the most control over. We have total control over what we eat. What we eat affects every single part of our bodies, on the inside and on the outside. 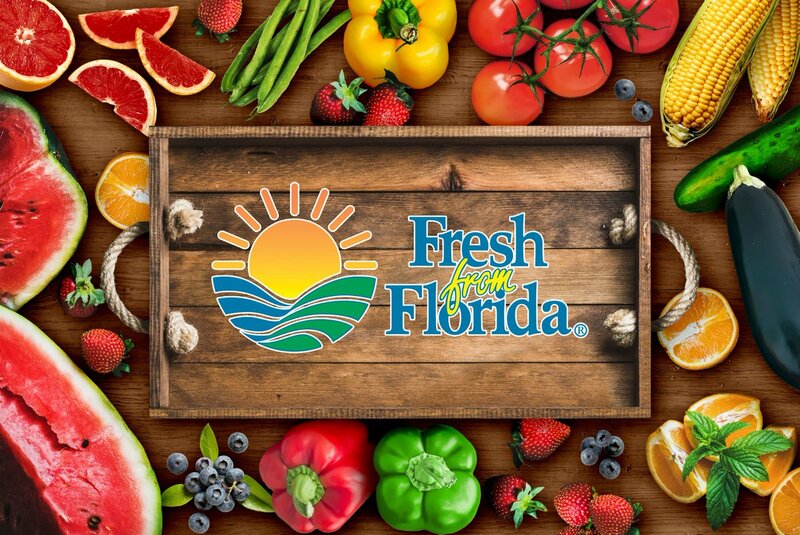 All of the fruits and vegetables that are grown in Florida have incredible health benefits and are easily accessible and affordable to everyone who lives here. Healthcare is expensive; healthy eating doesn’t have to be. If you need a bit more convincing, check out the nutrients and benefits some of Florida’s favorite fruits and vegetables can offer you. Avocados are high in vitamins and nutrients B2, B3, B5, B6, C, E, K, potassium, magnesium, manganese, copper, iron, zinc, heart-healthy monounsaturated fatty acids, and oleic acid (helps reduce inflammation). Avocados actually help your body absorb nutrients from other plant-based foods. They are also loaded with antioxidants, which support your immune system and anti-aging defenses. Carrots can help prevent heart disease, lower blood pressure, boost immunity, aid in digestion, prevent cancer, improve eyesight, improve oral health, and control diabetes. Oranges, Florida’s most famous fruit, is jam packed with vitamin C. Like carrots, oranges can help strengthen your immune system, promote heart health, prevent certain types of cancer, lower blood pressure, lower cholesterol, and even make your skin glow. Tomatoes are one of the main exports in Florida. This juicy fruit helps fight early signs of aging, aids your liver and kidneys in detoxifying your body, stimulates circulation, improves digestion, and even lowers your risk of cardiovascular disease. You can probably imagine how amazing all of the other fruits and vegetables on the above list are for you based on how nutrient-packed and powerful these four fruits and vegetables are. Your diet and health are directly linked. The better you eat, the better you will feel. Try checking out a local farmer’s market in your area and load up on Florida’s finest bounty; your body will thank you.